What does a festival and whiskey have in common? Well, in fact a lot if the festival in question is Grape and the whiskey is Jameson. No matter which one we consider both of them have quality and chill-out written all over them. The beloved Irish whiskey brand Jameson is currently engaged in active cooperation with various communities and musicians leading to Festival Grape becoming a no-brainer outcome of all its actions. Grape is getting more and more popular literally by the year, only surpassed by Pohoda it is getting an increasing respect in Slovakia as far as festivals are concerned. Bottom line is as far as music goes the right choice has been made and Jameson was given the opportunity to put its extensive experience under its belt to good use. To make the long story short both of them are so much similar in what they do – in both cases we are talking about top-shelf products that are associated with awesomeness and chill-out. 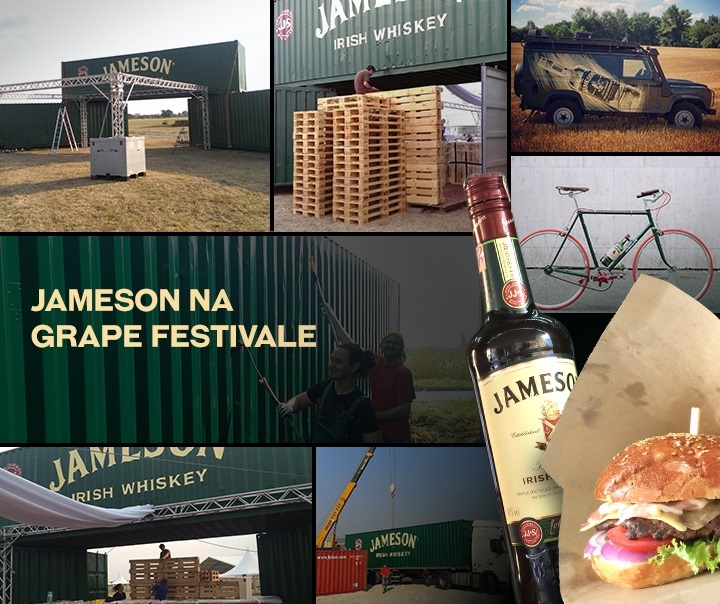 Jameson’s activation-engagement was launched back in March at the Winter Grape Festival at the Kosodrevina cottage and successfully resumed a rotational as well as animated promo-event in select pubs all over Slovakia. Jameson has joined a couple of warm-up events prior to some festivals since then, such as press conferences or bands that made appearances later on at summer festivals. Jameson took pride in one of the nicest and exciting zones right in the place of the event; not only a lovely and more importantly full bar, it also had a lot of activities available for visitors of the festival such as Jameson Barber Shop, ping pong, table football, a chance to win a Jameson bicycle, the Jameson Wallet event was a major success, too where visitors had the chance to win Jameson t-shirts, drinks, backpacks and hats. Despite the festival ended sooner than expected due to the unfavorable weather all visitors had a blast for sure and having a great time next year is guaranteed, too where Jameson will be seen and more importantly enjoyed due to mostly the positive feedback from visitors and organizers. In any case meet you there at Grape 2016!